Chameleon Boot Loader with netkas’ PC_EFI The new Boot Loader allows you boot up to different OSes in different partition and along side with native GUID partition support. Its even capable of supporting PC Graphics Card out of the box (such as NVIDIA and ATI cards) . It even supports DSDT patching allowing you to make your BIOS to behave like a Mac’s EFI without the need to flash your BIOS ! Its Install-n-Forget With the help of myHack installer* , Empire EFI allows users to install latest updates from Apple without worrying much about kernel extensions and such. In an event of mess up , simply use your Empire EFI disc and boot up your partition to get it up and running ! Post-Installation packages and how-tos would enable you to get up and Install Snow Leopard. It contains links where you can download kexts from , myHack Installer (which takes care of installing Boot Loader and other things) and not to mention link to download DSDTDE and DPCIMananger for your kext and DSDT needs ! CD-R/CD-RW to burn Empire EFI ! 3. Burn the desired ISO at the slowest speed possible. Note : if you are having issues such as chameleon seeing Snow Leopard DVD as a HDD or unable to detect , scroll down and read the FAQ ! Suppose if the newest and greatest version did not work for you , I do offer cooked version and special versions of Empire EFI for certain boards. If the generic version did not work , do try these other flavours. If you’re looking for an older build of Empire EFI , scroll down and grab it directly from my changelog. Special ‘Cooked’ Version for Problematic Board (Empire EFI Version 1.01) (Mirror #1)- A lot of folks are complaining on why it doesn’t work on their board. Some do get the memory allocation error. I’ve cooked a special version of Empire EFI on this problematic boards by using ISOLinux. So if you could get Linux Live CD to boot , there is a high chance that you can get this to boot up as well. Try this version if you’re having problem with the default version ! If the default version did not work , then feel free to try the special version for Intel Core i7 users/X58 by aschar. Its known to work for a lot of Intel Core i7 users. Its specially tuned for X58 Motherboards ! Empire EFI for Intel Core i7 and Intel X58 Chipset (V1.04 by aschar) – This version is tuned for X58 Chipset. it contains support for X58 Chipset and you shouldn’t be getting any black screens on your X58 Chipset with Core i7 processors. aschar who is also an i7 user has built this cd (by the way – knows exactly the do and donts of X58 and Core i7) . This version contains special X58 extensions , a guide on how to patch ALC889a codec (which is commonly found on X58 motherboards) and other X58 related stuff. If you do have any issues with this version , do post a comment about it and I’ll forward it to aschar , or you may just go to #snowleopard (irc.osx86.hu) and talk to aschar ! Empire EFI for Intel Core i7 and Intel X58 Chipset (Beta/V1.06 by aschar) – This is a beta version with support for ATI and some other changes for Intel X58 Users. For non-gigabyte X58 chipset boot with -pci0 (to do that , wait for 60 seconds , insert MacOS X DVD , and then hit tab twice and then type -pci0). NOTE : ATI Radeon 4850 users should use this Empire EFI version for Core i7 even if you are not using Core i7/X58 Chipset. This build has a special fix to enable 4850 to work with it. 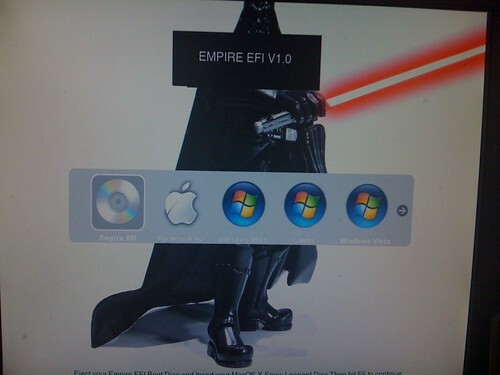 Empire EFI for AMD Processors (Experimental/V1.08 by nawcom) – This is an experimental version for AMD processors to enable them to use Retail Snow Leopard installation disk. However keep in mind that if you have more then 4GB of RAM installed , please remove some RAM and be sure to have less then 4GB of RAM otherwise you’ll run into some problems. There are some known issues with Empire EFI for AMD processors. Empire EFI for AMD Processors #2 (Experimental/V.108) (Mirror)- This is another take on Empire EFI for AMD. INstead of using supernforceata , I am using back the good ol’ nforceata which a lot of users recommended , plus I’ve added couple of more legacy kext. Instead of qoopz’ kernel , its using modbin’s modded kernel for AMD. Empire EFI for ATI Graphics (48xx series/V 1.08) – This is yet another experimental version by me. What I’ve done is that I’ve included the new ATI kexts from 10.6.2 into the DVD , thus allowing ATI Users to boot up to installer and install it. I’ve tested out this theory and indeed works. If you have something to say , feel free to post about it in my comments. If you’re seeking for help , feel free to drop by to #snowleopard @ irc.osx86.hu . I do welcome suggestions and even criticism on how I should improvise it . Please do. The empire is counting on you ! If Empire EFI did work for you and if you could run OSX beautifully , consider buying an Apple hardware as I truly think that Apple deserves the money for coming up with such a good hardware and OS which syncs in harmony ! -or- instead donate it to WWF or needy folks in Africa ! 1.If Empire EFI fails (i.e if you were getting errors , instant reboots and other stuff). You should try building your own snow leopard bootable usb boot stick , this is because Empire EFI is not a complete replacement of DIY-Snow-Leopard-Retail-DVD Solution . If you have a mac (or a hack) (running MacOSX 10.4 or later) , and a 8GB usb stick , you should consider reading this method instead. 2.From time to time , newer version of Empire EFI may not work with certain motherboards. You should try using an older version instead of a newer one. This is because a newer ones may contain experimental or new stuff which may not play nice with certain motherboards. 4.Plus those who are getting Snow Leopard DVD icon as a HD Icon. Go to your BIOS settings and change SATA operation to IDE (just try toggling between IDE and AHCI). It would eventually detect as a CD-ROM and it should work. There are few issues with certain SATA DVD-ROM Drives ! 5. if you’re having display issues i.e blank screen and other graphics related issue. You may have to use another graphics card. Generally GTX series does not work in installation and that goes the same for ATI 48xx users. However there are some number of users who have reported to get it to work with aschar’s cooked version. You may want to give that a shot ! The whole concept was started by Conti , aschar and the great team. A lot of people have underestimated the community thinking that what Py$tar did was right and they didn’t rip anyones project. I wanted to show to the world and those who have doubted the Hackint0sh team that its possible for people to come up with it and to simplify installation. Whlist we don’t offer paid support like pystar , I truly believe that there are lots of information that can be obtained from the community , not to mention that there is no fun when everything is done automagically for you. When you install an OS , there should be a little bit of fun of getting up and running. After all , we want people to learn at the same time. Personally I am getting sick of those distro users, this tries to save up time but again if you have the time its recommended to read on how its done manually ! If you’re getting issues such as “Memory allocation error” , please REMOVE all USB disks , pen drives and try again. Try to play with your BIOS settings as well. I can’t help much on this. Do make sure that your BIOS settings is set to something like this. Not all BIOSes do have these options , but try to look around. Edit : It seems that memory allocation error is caused by certain motherboard and BIOSes. You’ll have no choice but to use a USB installation method in this case. However I’ll look into it ! Set AHCI/RAID/SATA to enabled (or in AHCI mode) , Set HPET to 64-bit , Disable onboard IDE Controller (Don’t Disable this if you have an IDE DVD-ROM Drive) , Disable EIST (Intel SpeedStep) and if possible disable multi-core ! . You may enable them back after installation ! “Waiting for root device” – If you get this error while booting from the DVD it means that OSX does not support your controller (aka your southbridge , or in other words the current sata port). This is because you may be using jMicron or another sata controller. Try changing the sata connection to say another port and try again. It takes bit of trial and error. Some say that SATA port 0 did the trick , others say thats SATA port 1. If you’re still having issues , try the vmware method. From here , follow my other guide on how to install Snow Leopard via USB ! Gotta write a complete post-installation guide. If you need help with post-installation , simply check out Post-Installation folder in your Empire EFI CD once you’ve installed OSX. Its located in the Extras Folder ! I need your help and favour ! To the rest of you , who did not get Empire EFI working. Fear not , I’ll try my best to satisfy everyone , but I can’t do that as in order to make someone better off (aka to get their hardware working) , someone else has to suffer :P.
Okay then its time for me to tell why it works on certain people’s hardware and why it does not on others. By default Apple’s stock drivers only do support a limited number of motherboards , graphics card and things like that. What Empire EFI does is that it acts as a boot loader (thanks to chameleon) which injects drivers directly (without the need of using a patched OSX disc) that enables a variety (again , still limited but more then what apple has originally allowed) to work with. Although this method did seem to get a number of PCs to be a hack. There were quite number of PCs out there which did not work , there could be many reasons to this. One of the common reason (for graphics card) is that the graphics card vendors (i.e ASUS , Gigabyte , Sparkle , HIS) do not follow ATI/NVIDIA’s reference design. What I mean is that suppose if ATI says that for ATI Radeon 4850HD , there must be only two DVI Output , manufactures do not have to follow this as its just a recommendation by ATI. Instead they can tweak it by adding HDMI , VGA , S-Video out and all other connectors. Plus they can tweak the internals a bit to give you over clocking boost and other things. However , the moment they do not follow reference design , its a problem for OSX as Apple closely follows NVIDIA/ATI design recommendations. This explains why you’re getting errors with certain cards. Of course the only way to remedy/rectify this problem is to patch the kexts manually , but remember Empire EFI does not do that due to several reason. Firstly , you’ll be losing the “virginity” (or vanillaness) of the system which enables you to perform upgrades. Secondly , its impossible for me to swap/patch kexts (Drivers) on a read only media (you can’t write or alter the installation media as its read only). I do hope that you understand the reason why sometimes it works and sometimes it does not. 11/2/2009 – I think I know why it gives memory allocation error and why it doesn’t work on certain boards. These boards are pretty picky , so I am going to try to use ISOLinux method to load it up first instead of loading on the fly to check if it works. if it doesn’t – I’ll have to find a way to use PC_EFI v9. This could take time ! 11/29/2009 – Added support for AMD processors (thanks nawcom). Its now possible for AMD Users to install Retail Snow Leopard ! 12/2/2009 – Made a special version for ATI users ! 12/3/2009 – Made a special version for nvidia geforce gtx 2xx users and mobility geforce gtx2xx users and 1xx users as well ! 12/6/2009 – Added a new version for AMD folks. Hopefully it works for them ! Thank you to all of Team Hackint0sh for this wonderful release! I am downloading it right now and will give it a try tomorrow. Hi, been wondering bout the dfe-boot! Is it compatible with i7 & X58 based board? Can I use the your DFE-Boot & load the restored Leo/ SL from media such disk or thumb drive? I would love to hear your feedback. Initial tests which I did conduct on i7 were not that well. Do let me know if it did work , otherwise I’ll be coming up with an alternative solution for Intel i7/X58 users. ! I hope this is satire, otherwise I’ve just lost a lot of respect for the people involved in this. Same problem as mr. mario. Tried legacy USB disable and no external drives – same error. I’ve same problem wiff Mr. Mario. Need help please.. I too am having the same error when booting the empire disc. Im using a P35-DS3L board. It works on a abit ip35-e board, but due to lacking ahci i can’t use it. a new release to fix this would be great. First: Thanks for your efforts! I look forward to getting this working. Currently a Windows XP system on first 500gb sati drive. Have brand new, unused 1tb WD drive installed as secondary drive, which I intend to install SL OSX. And have dual boot. Still haven’t been able to reliably get AHCI running on WinXP to make the switch easy, but hoped to at least test out SL via your simple tools. Will just change bios settings depending on OS boot desired–not optimal, but livable for a short time. Any help on getting past the Mem alloc error would be most helpful. Hi, I have another problem. When preboot is mounted system restarts — any ideas? My system is Intel D945GCLF2 with newest bios update, Atom 330, 2.5″ 80 GB HDD (PATA) and LG DVD-RW drive (PATA). As for Intel Atom , its again either a hit or miss. i am not sure about the desktop series. Give me some room (and some time), I’ll see if i can put up Chameleon v1 (PC_EFI v9) on the dvd to get it up and running. Its known to work for Atoms ! I have a corei7-Giga GA-EX58-UD3R with a Saphire 4870-1Gb and 6Gb internal ram. What i’m a doing wrong? please help! I have the same problem with this and with rebel efi. My screen goes black and it shows NO SIGNAL message on my Display. But DVD is still loading something when I press ENTER key. I have the exact same problem on Asus P5Q (P45 chipset) and MSI 4870 MD1G. Google told me it might be the 4870 doing this. I received the same error doing your USB method, as well as the myHack method. If I use Netkas’ 10.3+ boot file with Gfx Enabler I get past it, but it hangs immediately after with a black screen and fuzzy white garbled-ness…. I was about to give up but now I am SO Close. Here is what i have. I could never get OSX to boot though UNTIL I got your disk and booted from it. It worked great. and I have sound and video perfectly. I cannot figure out how to not use the Boot disk and transfer the Chameleon setup to the drive to boot like I am booting from the CD. Thanks again and hope to hear from you guys soon! Cheers!! loading stops with a screen full of corrupted graphics. Is this the $29 one? if not Is there anyone on this w-bb forum that has hosted up the $29 version? if not are there any torrents for it? What would the $29 be called? Thats why im asking.. Do i have the upgrade version? or a backup version? I do see “Snow leopard Pre-release”.. What is that suppose to mean? I can’t help you with that and plus are you trying to get me into trouble. Don’t ever post those kinds of links here. FYI , its not a genuine disc. It seems to be altered ! Downloaded verion 1.0, burned it to a cd, booted from it, switched to SL install DVD. Afterwards the installation proccess seems to begin until something accures and it freezes on an error code somethin like 0x00000000 (general kernel panic?). I’m using a NEC laptop: C2D T8100 chipset: GM965 2GB ram. Am I doing something wrong or it’s another problem? Does it hang up on the Command looking like window? Just wanted to thank you again for your efforts! I have no doubt you’ll be able to solve many of these issues, and I for one want to be sure you have some free time as well, and actually have a chance to enjoy the project! /richie : It’s the same screen exacly! Could only be minor diffrences. Forgat to mention how good the this project seems to be, I wanted this kind of option (installing OSX on a pc) a long time ago so thanks for all of your efforts Pradeesh! I tested the current version of Empire EFI on a Intel D945GCLF Mini-ITX board and wanted to report that it gives a ISOLINUX Image is corrupt error. I have had similar issues with all other Snow Linux Boot-132 disks, yet these same disks will boot with no problems on other systems when tested. The weird thing is that the other referenced EFI software does boot, but immediately has a kernel panic after the snow leopard disk is inserted and the boot process starts to load it. Has anyone figured out how to duplicate the exact method that the other software is using to boot? I am wondering what is different for OSXLINUZ file that is being used has been altered from the original BOOT source code for Netkas’s PC-EFI software. And thank you Pradeesh for your work, it will be very usefull for a lot of people ! I found this patch kext exactly for our error, but i don’t know where to replace it !!! I did test Rebel EFI, and it worked great. However it didn’t get my onboard soundcard working. I made a support ticket to Psystar, and they just gave me alot of jibberish. So I decided to test Empire EFI on my rig. A bit mor manual “labour” to get it to work. But I am actually way more satisfied with the result now, than I was with Rebel EFI. All I needed to do was run the “myhack”, didn’t have to do any DSDT stuff. get my soundcard and graphicscard working. Hey Prasys, update this with the new PIIXATA to support all those ATA users out their =) Just a suggestion but I think it will greatly improve compatibility. If we install with the SATA compatibility mode in the BIOS, will it be possible to change this setting to AHCI after Snow Leopard installation complete ?? For exemple by changing the PIIXATA kext ?? Could you also include the kext for the gma950 for laptop please ? I’ll be updating the guide and not to mention to upload a working version for X58 users ! with REBEL EFI there´s no problem…….. Thanks for 1.04 update now it installs fine, but I have another problem when myHack Installer is installed, when MacOSX boots I get the same NO SIGNAL problem and hard drive is still working something. after installing MacOS Snow Leopard, how to make it bot from the HDD directly without having to use the CD i burned all the time ? Ang God bless you ! Got the 1.03 version to boot finally on my Abit IP35, it runs the OXS install fine but could not find any sata drives attached. The bios does not sadly have any option to set sata mode to AHCI. Will give 1.04 a try now and see. Thanks for that EFI builds. But where is the DL link for lastest 1.0.4 version ? Would be fine if you pun an dl link at the beginning with always newest version, so we can find it much easier. How to configure Gigabyte EP31-DS3L to work without memory ERROR. PLS. mitchde , sounds to me like more of a kext issue ! I have a good install with EP35 and Nvidia and VoodoHDA audio. I would love to boot without CD but osx is only occasional use. My problem is, after I boot with Empire disk into OSX I have to reassign My Win7 partion to “active” with a 7 recovery cd to let it boot back to Win7 without CD. Any Ideas, or does it just have work this way. Rebel EFI didn’t work for me, but that!! hi i can´t install it on a dell mini 9, in the darthvader screen i never see the osx disc after i put it in my external dvd usb drive…. I´m totally dumb and i really don´t want to contribute to the community. All my posts where i begged for help are answered with “use the search” or “read the manual”. I don´t want to read cause i´m just to lazy to engage myself if i can spend money and buy the product instead. So, could RebelEfi be the final solution for me? Nice one prasys! I like the idea (though i visit infi just frequently) of opening peoples eyes. I’m having the same problem with this as I had with Rebel – Blank screen after a few mins… seems to be a video card issue. I have a 260gtx, is there a work around for this? The myhack (which is the first thing you run after 1st boot into SL, its on the CD and it says you have to run it in the readme.txt) installs a bootloader, and that should make you able to choose OS when booting. No need for the CD. I have 2 drives. 1 with Snow Leopard (thanks to Pradeesh) and 1 drive with XP Pro and OSX 10.5.8. When I boot the PC, it boots from the SL drive (set it in the BIOS), which has the bootloader installed. Then I can choose any of the OS’es I have installed. Using a lenovo w500. Trying to install on a second hard drive in my optical bay. Tried empire efi v1.01 and 1.04, both did not work. v 1.04 freezes, and v 1.01 gives me a kernel panic about 30 seconds in, so i never get to mac. I tried rebel EFI, same thing. You have any ideas? Thank you SO much for this piece of software. I installed Snow Leopard onto an external HD, but now I can’t use Empire EFI to boot it. It won’t show up in the list. What can I do? I’m having the blank sceen issue on a Lenovo T60 notebook using v1.03. When I move to the $29 OSX disk, it starts to run, I see all the diags scroll by, but when it gets to the point where you get the gray’ish boot screen it just sits there for hours. My video is the Intel 945GM chipset.. I am using a usb cd drive to install…would that be a problem? How can I install bootthink to my usb drive? @blah There is a windows installer. You can google it and its at insanelymac , I believe. There is an official support thread over there. You’ll have to install it to your local HDD and boot it from there :P. i am not sure if you could install it to a USB drive. @Sam – ATI radeon X2000 series aren’t supported. You’ll have to boot from your DVD and remove the kexts. Thats why it panics. sorry to say that ATI X2000 series and ATI wouldn’t work , we’ll have to wait till its supported ! Is it safe? It gives me an error saying “The partition is hidden” or something like that. What gives? Thanks pradeesh. Does that mean I just have to wait, or is there some way to remove the kexts and make it work? Sorry i don’t really know much about kexts. If I could do it, how would i boot from DVD and remove the kexts? Ill keep you posted if i have any issues! I installed iDeneb, just to explore what the Mac world looked like and then decided to purchase Snow Leopard 10.6. I was banging my head against a brick wall for days trying to get it installed on my pc, using several hackintosh tutorials……..then I came across Empire EFI!!. I got it installed pretty much ok, and then spent some time getting the hardware to work. I was very pleased with the outcome,so I decide to load Windows 7 on the second partition (where I had iDeneb installed previously). Problem is now myHack installer is not working as it was before. I have to boot from the disc. I have 3 partitions, 1:1gb fat32. 2: 230gb SLeo 3: 230gb Win7. I would be very grateful for any help and thanks once again for the great software. I had previously tried the trial of Rebel EFI with no success. I was surprised to see that Empire EFI actually loaded and started the install process, but now I am at a roadblock. Installation is hanging after some command times out. I got all the way to a grey screen then it just stayed there, anything I can do? I have a problem with all versions of Empire EFI. After it boots I insert Snow Leopard installation DVD and then it launches installation but i only get black screen. I can tell that installation is launched because when I press Enter key DVD drive starts reading. When I move my mouse I get glitches (color dots moving) on my black screen. I think the problem is with my graphics card. I ran in to one error and don’t know where to go from here. Error: Uncompressed file is not the length recorded. Error: couldn’t uncompress plist file from multikext archive entry 0. Pradeesh, thank you for your commitment to this project. I greatly appreciate your dedication and effort. It is not an easy task and being a bit of a dope it wasn’t until I came across your blog that I was able to do a vanilla install of Snow Leopard on my i7 920, Gigabyt X58 Extreme. So far the only obvious thing not working is sound. X Bench scores are just over 200. I have yet to clock the chip. Link to my XBench result. forget to mention! great work! and stops at this point. If the thing hangs at somewhere , most likely your card is not supported. I am looking into GTX 2xx series issue anyway (black screen issue) and ATI issue. I am sorry to say that ATI Radeon X2000/X3000 and all mobility HD series are not supported in Snow Leopard. Don’t ask me. I’ll post updates if there are any breakthroughs (which I highly doubt). So we will just have to wait and see on how it progresses. I’ve got running ati x1550 video card in leopard with no problems and it’s supported. the MB is an MSI MS-7502. is because is not a Gigabyte the mb? this should be in this post Sorry –maybe you delet the other? Yo Pradeesh, Word up and big repect! Gonna donate via Paypal to YOU right now! I got problem when running it as well. Everyone says they get 1c9b20a0 i got different one though. Same error with 1.4 and 1.3. Might try older version later. After it starts loading the preboot.dmg file it reboots, so I may need to use the kexts that I used for the USB boot device that I created using instructions and software from macinized’s SL Macboot method on the insanelymac forum. Could you possibly send me a instruction sheet on how you made the 1.04 version of empire efi. I would like to create a customized Boot-132 CD for the D945GCLF that is similar to the empire efi disk. You can contact me at the email address I used to post this comment. Thank you for any info you can send my way. Should i dl 1.2 x58 or click the 1.4? It says beta version 1.4 for x58 chipset but when u click it it says its 1.2 and the darth vader pic is 1.4 but doesnt say x58.. which one?! Well i used the x58 version. It boots to the vader screen, i can run the OSX but all i see is white text on a white background so i cant read anything and then the PC reboots. Any ideas? Anyone else with a similar setup? I’m looking into all the issues which have been said here. Currently , I’ll be uploading a special version for Nvidia , VIA chipset users and as well as a kext for problematic ICH9-R/M users ! Hello. I installed the snow leopard with efi empire, but when I upgrade to version 10.6.1 I have a kernel panic. Can not you update your system from “Software Update”?. Before, I had installed the iATKOS 10.5.7 with voodoo HDA kext sound but now this kext does not work for me. “Empire EFI only works on Intel Core 2 Duo , Core Duo , Atom , Core Solo , Core 2 Solo , Intel Xeon and Intel Core i7” –> So there is no support for Intel Core 2 Quad? My system: Mobo EX58-UD5, Core i7 920, 6Gb Ram, GTX 285 and a 320Gb Western Digital hard drive. When i press enter to install Snow Leopard, it show some text and the PC reboot. Hope you fix it! Fisrt of all let me congratulate you on a fine jos. Secondth, i want to ask is it possible to move all on my hdd and not having to boot from a cd everytime i want to get inside my Snow Leopard Installlation ? I just wanted to say thanks. You and your work on Empire EFI are greatly appreciated. Leopard Snow installation begins but suddenly the screen goes black, i think due to the graphics card. Also in a Toshiba A200-20Y. I can install, no sound, no bluethoot and no wifi (ethernet is right). Not perfect but it’s enough by now, unfortunatelly after 10.6.1 update, keyboard doesn’t works anymore. Uil, you have to reinstall the keyboard. In reality there had to be installed when you ran MyHack keyboard installer. There is an option that lets you choose the keyboard ApplePS2Controlled. Sorry, no I am speaking very well in English. I just do not work for me is the sound. My card is ALC862 @ Intel 82801 GBMICH7-M and was doing work with the kext of voodoo in my iATKOS. I worked even headphones. But now there is no way. Install 32/64-bit of voodoo or those that come with the iATKOS. Can you give me an idea? VoodooHDA (32-/64-bit) kext worked fine for my ALC882. Though only “Line out” works. “Line in/Mic” doesn’t work, but its no big deal for me. Hi there, First of all I would like to thank you for your great contribution. I tried Rebel EFI when issued, but did not work. Cust support is bad, no real help. BUT – Empire EFI works beautifully! I managed to install the OS X 10.6 on my Q6600 PC with no special pain. Again, many thanks. The issues start, however, at the post-installation. I think that this part needs improvement. I connect my PC to the net using wireless (Edimax PCI card), and since it was not identified, I have no net yet. I need to grab a long cable from my router to the PC. I hope it will help with other drivers notably the screen. BTW – I did not find a clear link in your post to the latest version of Empire EFI. I tried to install Mac OS on my external HDD (USB). No problem during the install of Mac OS X SL. I see the screen “Installation finished”. When the PC reboots, I changed the CD and I put Empire EFI CD. I select Mac OS, I see some text (white on white it’s difficult to see something). I can detect on the black cape of Dark Vador 🙂 multiple lines finishing with “timeout 0”. And that’s all… I suppose it’s an USB problem. Do you think it’s possible to correct that? Any update on support for GF2XX cards? First off… excellent work. Really. I did try rebel EFI on a fujitsu P8010 notebook – and it worked.. no network and other things but it did work.. I then tried Empire EFI and it blew me away. I installed the “myHack installation first” – then rebooted.. then the screen went all funny with vertical lines of different colours – i.e. like the incorrect screen resolution has been selected. The screen on the P8010 only supports “1024×768″ so i tried to use Graphics Mode”=”1024x768x32” at the loader window. Then hangs and no keyboard input accepted. The problem is now, that even though I did the post installation stuff, I can only boot into SL with the empire EFI CD. It seems like the installation of the chameleon stuff did not work. Can you explain me, how I can solve this issue? And, by the way, do you know the issue that when I open a image in “preview” is does not show it. Same in iPhoto, if I double-click on a picture or try to edit the “faces” nothing happens after the click. Seems like there is a problem with the image zoom. Well, as you have not gotten sound to work with you VoodooHDA 32-64 slogmo. I’ve installed several ways, using the terminal and kext Helper. Repairing permissions, and nothing, still not working. Can you say how you installed you?. The sound already works me!. I removed AppleHDA.kext from the Extensions folder and run the sound. Wow!. But it doesn’t start and reboot the computer. I tried v1.0.1 and 1.0.4. When I’m about to install SL DVD, shortly afterwards I get this messed up screen, all pixelated, really weird. Also, for some reason when I change in BIOS from IDE to AHCI, DVD won’t load nor other HDD’s so I have to use IDE. I disabled Speedstep, but I can’t find where to change to 64-bit. Does the screen at install get all messed up because of my graphics card? How do I fix this? I’m running out of install guides. If I could use this EFI bootloader I’ll turn religious. why are all you guys trashing trashing psystar? i have to be honest, i have tried all versions of empire-efi and nothing has booted my system. however, rebel-efi worked the first time out. i would hate to pay for something i could get for free, but it doesn’t seem to have as broad as support as rebel-efi..
NVidia 9500 GT 1GB gfx card. I tried 1.04 and I only see the rotating | / – \ animation but nothing is coming. Same as after every update of your EFI: where is the download link to V 1.0.5 ? Would be fine you would have an section at the beginning with all links. > Same as after every update of your EFI: where is the download link to V 1.0.5 ? Yeah, I was blind also. There is a large image showing Darth Vader’s helmet … Check it out. The only thing i can get to boot and install is a SNOWosx 3.5, but after install osx locks up on boot. I have a very generic setup. Was version 1.05 just release last night? Nov 10th? Just a little update things look promising with new version 1.05!! Just burned here at work and tested on my work pc (dell optiplex 745) and it booted right into Darth vader, i hope this will boot my DFI p35 board at home, Crossing my fingers! Ok, what the hell is wrong with my setup. It won’t even get the install running with the latest 1.05! It reports that VodooHDA can’t be found or loaded, don’t remember exactly, but it’s making fuss about this VodooHDA and then it stops within 5 seconds of install. And still, I can’t use AHCI, even though it’s in my BIOS menu. It won’t start reading from DVD or HDD’s if it’s in AHCI mode. I have patched BIOS by Juzzi. Bugzy, did you try unplugging all other drives and make sure you have your taget drive on sata 1? Thank you for your suggestion, I’ll try switching my drives. I don’t think I have target drive set as sata 1. Will post back the results. Switched my target drive to sata 1 and unplugged my other windows 7 drive. No change. It reports that it’s unable to load VoodooHDA kext. Then I reset and tried rd=diskXsX, still nothing, it posts the same unable to load (or find) VoodooHDA kext. then I tried with -v -f. It kept on loading, it seemed like it was gonna finally work, but then the screen gets all f….. up, totally corrupt, pixelated, and then it stops. I read hundreds of posts from other people having been able to install SL on their asus p5q series boards, but not one has exactly the same p5q3 deluxe board. This is really frustrating. Does anyone have any suggestions or some good links? Xavi, do you speak Spanish? rd=diskXsX isnt the command it would be rd=disk1s1 for disk 1 partition 1. I just wrote a general command in my reply, I did put the corresponding numbers where x’s are. It doesn’t make a bit of difference. kext org.voodo.driver.VoodooHDA – library kext com.apple.iokit.IOAudioFamily not found. can’t load kext org.voodoo.VoodooHDA – failed to resolve library dependancies. failed to load kext.org.voodoo.driver.VoodooHDA (error 0xdc00800e). Hi, men! I’m Andrea from Italy, I’ve a problem with empire-efi… I’ve a Asus P5QL-e MB, intel E7200 processor, DVDRW sata, Samsung HD320GB, Ati hd4850… now i’m running leopard 10.5.8 correctly… I’ve buyed a 29€ Snow DVD and booted with Epireefi 1.05. When I see Darth I wait about 1 minute, then I eject the cd and I insert the Snow one, but, when I press F5 to refresh the list the EFICD icon is trasformed in HardDisk icon with “snow leopard” title, the dvd spin for two sec, then it stops. If I press again F5 and It remains with HD icon with no title (no dvd spin at all). If I try to press “enter” on swon leopard HD icon (it’s a DVD!) nothing happens… any help will be apreciated. NOTE: the first time i’ve tried with empireefi 1.01 and all was fine (F5= DVD icon) but then installation hangs after few minutes on white lines on screen (maybe 1.01 doesn’t support ati hd48xx)… the all the time I’ve tried again I’ve had the same problem of the “HD icon”. Still no luck with my HD4850 – still a screen full of garble. why you guys not reading what pradeesh wrote? that’s what worked for me… asus p5w dh deluxe, core2duo e6600, nvidia 7600. 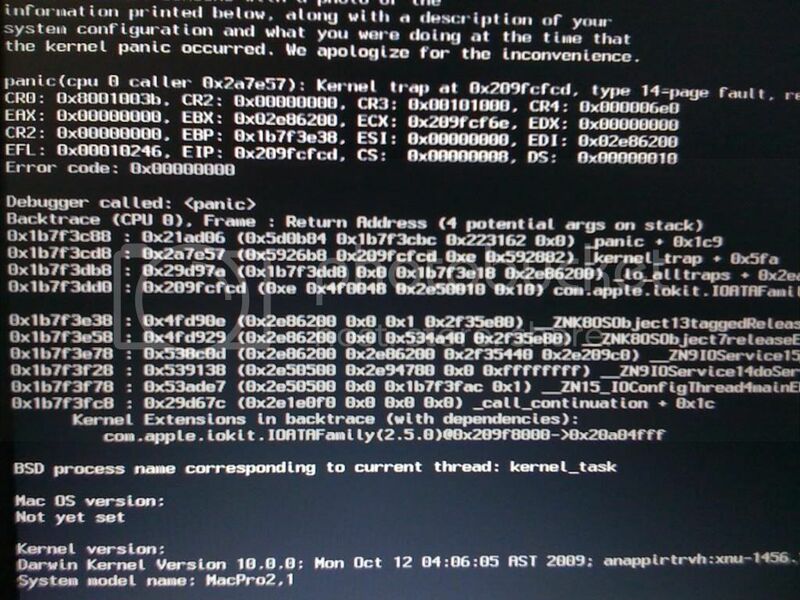 Anyone solve the kernel panic error after os x disc is in? 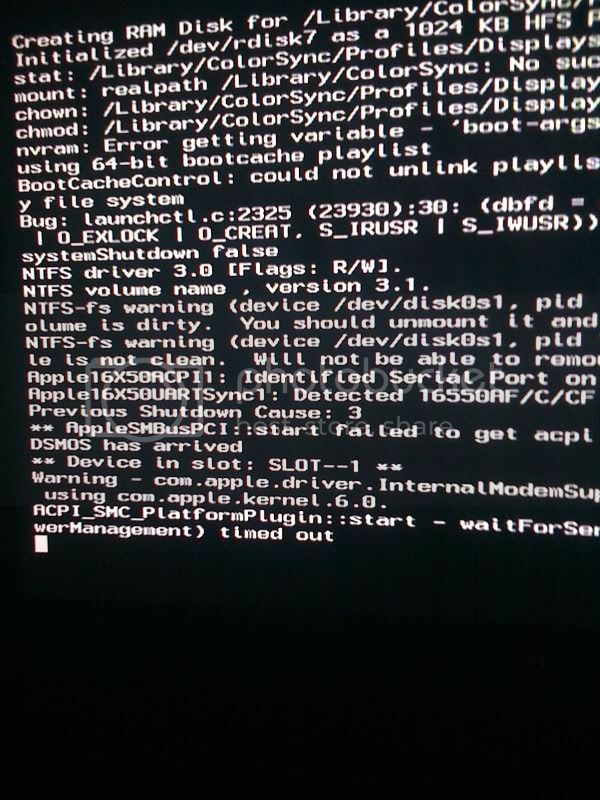 it never even reaches the apple screen just gives alot of code and a kernel panic error? so… all boots ok – no [visible] errors… but seems to hang once booted [no mouse or keyboard] BUT… clock still working. Note this is not a netbook but very cool fujitsu notebook [not netbook] with specs in my earlier post. Pradeesh, I applaud your work, I wish I could get this going! bombay, well if $50 works , then go ahead and use it. Rebel EFI is a rip , I’ve solid evidences. Pystar should just release the source code if they think that its legit job. booted into Empire efi, ran install, the install got stuck at “23 minutes remaining” for a while,..
got a little scared, then it looked like the install crashed.. popped the empire dvd back in, booted back up and BOOM!, OSX welcome screen… YESSS! Does it support the intel G31 mainboard? You said it support the G33 mainboard..
$50 is cheap for something that works vs. something free that doesn’t. Why does it boot every system I have (Rebel that is) yet Empire claims to be ripped off and it (Empire) does not boot on any system I have? I’m using the x58 version of Empire and it just stops at the AppleIntelCPUPowerManagement timing out when trying to boot from the OS X disc. I also was blind to look at that below helmet link. note: rebel-efi starts but i got a stuck with white screen. New fresh day.. though i would see if these more details specs would assist in someone giving me clues about my systems suitability for SL. i do plan to dual boot this unit with Windows7 as a fallback for those things i cannot do OR is the SL system is broken. BTW… we have two MBP in the house… and many [older] windows units.. BUT the kids have gone Mac so thought this might be an option..
Bluetooth® V2.0 + EDR, 1000/100/10Mbps2 Gigabit Ethernet PCI Express x 1 and Intel® Wireless WiFi Link 4965AGN network connection with three antennas. Separate ON/OFF switch for wireless network connection. Built-in 1.3 Mega Pixel camera3. It would work except for wifi , which needs to be replaced. I am not too sure about ethernet , but apart from that everything seems to be good to go. Oh yeah you can’t dual boot. If you plan do dual boot , then you should opt for installing OSX via USB stick , as it would be possible to do MBR installation ! I had been advised about wifi and have ordered a $14 replacement from Hong Kong. Did not know about the dualboot.. as though chameleon would handle this via your excellent installaion. i did see mention of a USB process but no link – it is as easy as Empire EFI? I’m really excited about installing Mac OS in my notebook, since I need to start developing iPhone applications as soon as possible. I’ve read the README.txt and this line caught my attention: “Secondly , its recommended that you install it to another HDD (especially if you have Windows or another OS installed) “. 1. Is it really risky to partition my disk, where I currently have Windows XP installed, in order to try to install Mac OS in a second partition? 2. To avoid that all my Windows XP data gets erased, will it be possible to install Mac OS on my external USB drive? Looks like an x58 1.06 came out last night. I’ll try that when I get home. 1. You can’t have Windows and OSX on the same disc. Windows uses MBR partitioning and OSX uses GUID. 2. Yeah, you could always do that. i still get the blank screen right before the osx installer screen should come and ask for language. looks like the graphics-card is not supported by now. I am trying to install SL on a laptop (Toshiba Tecra M9). The BIOS does not allow the modification of the ATA settings. I did have this laptop running on iDeneb 10.5.8 without any issues. If you would kind enough to create a customize version of your iso, that would be great. Thank you. Hey Anyone find a fix to the ktext error for not having a second ide channel enabled? First thanks for all the effort you are putting in this project. Assuming you mean “Installing Snow Leopard for OSX86”? Further reading through various guides suggested that i should be running 32bit system while chameleon would force 62bit. would this effect my frozen mouse and keyboard? Also – after myHack – should i have LAN adapter / sound available? trying #snowleopard also… might see you there..
1.06 is a no go on my system, like all previous versions, with pretty much the same errors, ending with “still waiting for root device”. Does anyone have a problem with AHCI mode, like when you enable it and the dvd player and hard disks won’t work? In IDE I was able to install iDeneb 10.5.7. Does anyone have any ideas? Got it all installed. Unless you add -pci0 to the boot.plist, it will just sit at AppleIntelCPUPowerManagement timed out, so be sure to add that string. Hi, I am very thankful for your hard work! I am eager to try your bootloader. The only problem is that I cannot get the empire EFI cd to even boot. It just boots back into window. I can boot from a cd. I have tested that with an ubuntu cd. There versions i have tried are 1.6, 1.3 1.0 and 1.6 (for problematic boards). I dont know why none of them have even booted. I tried instaling osx using rebel efi ( i didnt pay em any money, i just used a trial) and that booted fine, i even installed osx. the only thing that is on the screen is a flashing “_” then it boots into windows. Any Ideas? I want to figure out how to be able to boot onto empire efi and then install snow leopard. Thank you. I’d say maybe make sure you’re burning the ISO right so it’s bootable. Thats not the issue. But thanks for responding. I can confirm that it is not because I use that software to burn other bootable cd’s like rebel efi when i tried it. Any other suggestions? like i said it is weird because the rebel efi boot thing worked. so did other bootloaders. Any help is appreciated. Thank you. Well you were right! My software decided to change settings without letting me know. It reverted back to original settings (a data cd). Im burning a new cd right now. It should work. Thanks for inadvertently helping me out! I tried version 1.06 for x58 but it still does not work. Giga ex58-ud5, 6Gb DDR3, GTX 285, WD 320Gb. After i press enter to install SL, some text appear and the system restart. Make sure you’re waiting about a minute after you see Vader to be sure everything’s loaded. Does not work on HP ProBook 4510s. After an insert instal DVD Snow Leopard Retail, system installation stops on “still-waiting-root-device”. I have also the same issue with: still waiting for root device. First, you made a great job and thanks a lot for that. When I tried 1.01 like a lot of people, I have memory error. I tried 1.01 special memory patch and it’s ok. But now it can’t find the harddrive and block after the firewire detection. “still waiting for boot device” (something like that) 3-4 times on the screen. Is there a bios parameter i haven’t seen ? or must i wait for a fix ? Just wanted to let you know that I was able to install SL using your guide and the guide below. thanks for your effort on this! i changed the gtx260+ for a 9800GT. now i can load into the installer, but i can´t erase/format drives or start the installation, cause it hangs at the moment i click erase, and if i just try to install it then says “20 minutes remaining” and hangs forever. I also got my GTX295 working correctly, so I can confirm the card is supported. You realize the myHack Installer is included with Empire-EFI, right? I’d run a hard drive scan to make sure your drive isn’t failing. i tried 3 different harddrives, i think it´s more a ahci/sata/bridge driver-problem. iatkos_v7 works without a problem. thanks Pradeesh as always – just love following this board. I updated to 1.06 and did full re-install. After reboot [all nice], SL boots up and while notebook Mouse and kboard did not work.. USB mouse worked. I can also confirm there is no LAN option in network, no sound options/devices. Is there now an easy way to know what kexts to install to make these devices work? First, thank you very much for your work. It’s awesome !! – My ATI 4670 HD doesn’t want to work except if I add ‘-x “Graphics Mode”=”1280x1024x32” ‘ in the boot line. – My Mhack doesn’t want to access to my network drives (which works on my laptop and on my powerbook under Leopard) do you think it can have a link with the safe mode ? I used the 1.05 version. Thanks again for your work !! hello to all can i install leopard or maybe snow leopard in my amd? if it possible how? your files and hacks help me? logo and spinning wheel, I have the retail DVD. I was using to help make the USB installer when I tried the Lifehacker guide. Good morning folks. I don’t have any Mac. Will I still be able to have an SL on pc? I was reading the other link that durianmy said. Lasly, where can I get SL? Got it. But will I be able to install SL on my pc if I don’t have any running MAC here? I’m coming from pure Windows o.s. and would like to learn a new o.s. why there is a problem ?? With 1.01-1.04 as all write here with NVidia GT200 based videocard I also lost video signal after a minute after a change CDs with SL installation DVD. SATA HDD with AHCI mode. try changing the order of you drives on the motherboard. try with only your optical drive and a single harddrive… I had a problem not being able to get to the install because my harddrive was in the SATA0 port and my optical was on SATA1, then I switched it, and BLAM! worked. hi , thank you so much for the new version , the legacy version worked for me , but when i inserted the the retail dvd , I got a black screen , is something else i should do ? could someone please confirm, that an GTX260 should work to get me into the installer? thanks! Hey man, great installer you have made here. I have tried all other methods for SL, including EFi-X 1.1, nothing worked. Tried yours, works perfect first time! Still having alittle trouble getting it to boot without the disc, but I’m working through it. Just wanted to say thanks, and great work! asus p5kc still waiting for root device. best wishes & thanks for this great tool. Now im just looking for a GOOD Way to make sound Work, i have made the sound work once but that only happened since i updated to 10.6.2 but then when i restarted the sound went off again, so every time i install SL i do the same thing but then i cannot restore sound after REBOOT, oh and one more thing, how do i make the RAM maxmem=3072 boot like this permanently without typing this every time on chameleon?? any help is appreciated, thank you! Installs pefect, with Onboard Video disabled, USB Enhanced works, No Sound or Unknown nVidia Display, no higher than 1024×768, which can be done with EFI String, then it works without problems. I can use Voodo for sound and then the on-board sound works. The issue I have is when I do the Post-Install myInstall, it will boot and I love the iHack background, but the USB becomes damaged, no mount, no USB Keyboard or Mouse. Otherwise… GREAT JOB!!!! Just the easy of the installs for Snow Leopard, plus it Updates to 10.6.2 without ANY issues. if anyone has made this one work please let me know! Where am i supposed to find kext that fits to my computer? is there a website for it or is it only by using google? Audio was working but after a pfix.. have lost it. I have an Asus P5B premium Vista Edition , I’m planning to buy a new Grafic card (9800 Gt) to try Empire Efi (now I have a 2600Xt) , Did someone used Empire efi with this mobo , everything should work fine with E-Efi 1.07? No success.. Also i7 version and hd4850..
Thanx anyway pradesh.. keep it on. U r great! hi , thank you for this awesome bootloader , its really great , with it , i am able to boot and install the retail snow leopard disc but , something happened , i successfully booted the retail dvd and entered to the installation and everything went smoothly so far , and after the installation insert the cd boot ( i am using the leacy version ) and eject it and insert the retail disc and press enter it makes something and then stops at (nforce unit found=0) and its written many times and sometimes it brings the ( waiting for root ) so what should i do ? First of all – thanks or the efforts you’ve put into developing empire efi. And here’s my question – I’m getting ACPI kernel panic error at the very beginning of the snow leopard installation on two different computers. The first one is Asus P5K-E WiFi/E8400/HD4870.. the second is an Asus notebook – F3E (965 chipset/T7100/X3100). And since the computers are pretty different I guess I’m making a mistake somewhere. I’ve tested 1.04 and 1.07 releases, disabled speedstep, usb, firewire, played with ACPI BIOS settings… but still no luck. If you integrate this fix linked below into your Empire EFI somehow, you should be able to fix the black screen problem many people are having with their “GTX 2XX” cards. It worked for me with my GTX 280. I had to first change my graphics card to an old 8800GTS to get the OS installed first (using EFI 1.05). 260gtx resulted in blank screen after kernel boot-up, but with 6800gt everything is fine! ATI Radeon 300 series – (Old). Neither the nVidia 295 GTX (At least this is known as non-working video card yet), please reply if I’m incorrect on this video card, if the ‘fix’ for it has been released. Thanks very much, and please hope to hear good progress on these devices previously mentioned. To those who get “waiting for root device”. Do you have the SATA drive on the correct SATA-port? I’ve read a few places that you should have the SL SATA disk on the main SATA (channel 0). I’ve tryed to run it with the last update and still stops at the same point. IO80211 Controller::dataLinkLayerAttachComplete(); adding AppleEFINVRAM notification. Gigabyte GA-X48 DS4: Only v1.02 for x58 works. All other versions (legacy too) stops after AppleIntelCPUPowerManagement. I was able to install osX with v1.02 but after installing myHack it would not boot past myHack logo at boot. I got good help at #snowleopard and installed driver for ati 4870 (LegacyATI4800Controller.kext) and added -pci1 to com.apple.boot.plist and everything booted ok. Right now everything works and i’m a very happy man. I would like to thank all involved in making this possible. Very nice work and much apreciated !! Optiarc SATA DVD-RW -Image burned to CD-RW with Nero. BIOS – Speedstep tried both on or off – everything else as advised. I got my 295 working by using netkios enabler and adding the efi string to the boot.plist. Simple as pie. You do this by modifying this Emprire EFI? Or you install SL with other card, edit files and then only can use GTX 295? When I get to the first OSX install screen, and can choose language – I can’t use my mouse or keyboard. None of them reacts. Both are connected via USB on my Asus P5W DH Deluxe motherboard. And: is it any possibility to install from a USB flash drive, and can I prepare the USB without a Mac? With all the versions only it(he,she) recognizes me 1 GB of memory(report) RAM. I have 4 installed GB, but not, always 1 GB goes out for me only. Why is it this like that? I tried 1.07 RC2 Legacy and memory errors is ok. But now the Dvd stop working after a while. I clearly ear it stop (like there’s no power inside). Step by step, things are getting better. First of all, thanks for your efforts. I’m stuck on “still waiting for root device”, and my DVD drive is an IDE one (sata DVD drives are still not widely spread over here in Argentina), do you think that getting a sata drive would help? I do admit v1.07 has a lot of bugs on some motherboards , mainly waiting for root device issue. nForce support did break a lot of things and most likely , I’ll be dropping support for non-Intel boards. Folks can however still use this version if they have nForce ! does the IOATAfamily have something to do with non-responding harddisks inside the installer(disk utility)? nvidia gt2xx compatibility would be awesome. I never had to modify Empire-EFI or swap out video cards. Using the -pci0 boot flag I was able to get into a low resolution GUI where I could then install the NVEnabler and then inject my EFI string into the boot.plist. This project looks very promising, doesn’t look like Psystar will be a ‘competitor’ for much longer though! I was wondering if anyone could reccommend a good build for this… I was hoping for a motherboard with support for i5/i7 and ddr3 ram with everything else supported out of the box. The ‘lifehacker build’ looks good for now but it doesnt support ddr3 and i7 for future upgrades. Graphics wise I am thinking a nv 9800/ ati 4850 or something like that. In the mean time, Im going to try to get this running on my Dell Vostro 1510, I have a perfect install using hacked kexts so im going to try using this to see how it goes. If I install myHack on the DG31PR, it sees the memory correctly, (4GB), but it breaks the USB. Before the myHack, it shows USB Enhanced on (2) Ports, after the install of myHack, USB will not allow mounting of devices. Another strange things is that my WD500GB SATA II never shows on the Desktop, it acts like it is invisible. I can manual accesses it and it boots, etc. This is even before I install myHack and before updates, etc, and even after updates, it just never shows. All other devices before myHack install will mount DVD, USB Drives, and USB Sticks, and show the icon, not not the boot OSX. I think I am missing something. Want to say this looks interesting indeed, but only thing that makes empire-efi slow down now is lack of clear compatibility chart. > my Asus P5W DH Deluxe motherboard. I’ve noticed a similar behaviour on my Gigabyte EP45-DS3L with Apple Mighty Mouse and Apple Aluminium Keyboard. The mouse pointer can be moved with the mouse, but clicking doesn’t work. But … wait. Just wait long enough. Really long enough. After eons (felt time, acutally some minutes) clicking DOES work and installation continues. (Seen that with EEFI 1.05 and both SL and SL Server). You posted, that adding GTX 295 is very easy, but how you add -pci0 flag then installing SL using EmpireEFI? Flag can be added after installing, but it hungs a minute after EFI CD swap with SL DVD at installation. So you didn’t used EFI? or there is some way with EFI to install SL with simple GUI? Hey Pradeesh, just wanted to say thanks again, I cant seem to get the machine to boot without the disc. I installed my hack, the system boots and goes to a blue screen with mouse, looks like its at the proper resolution. But just stays there, I’ve tried a 7800GT and now a 9800GT, both do the same. I can use the system fine when I boot with the disc. Any idea’s? Thanks! well ive been doing my head in trying to get this working so far ive done this much… can someone please help getting this up and running. – second partition is fat32 i formated it to journaled but macosx does not pick it up so i cant install on that partition because it says its not a GUID partition. – i tried looking for a solution to this problem and i found a post that told me how to change the contents of a mpkg file so that it will allow macosx to install on mbr partition. This did not work for me. Can someone please give me better instructions on how to get this running pleaseeeeeeeeeeeeeeee. I have an iMac 27 and an Acer Aspire 1410. The Acer does not have a DVD drive and I can only use a USB stick with the Retail Snow Leopard restored on it for installing. Is there a USB version of EmpireEFI I can install on another USB stick to boot the Acer notebook? I tried copying the EmpireEFI iso to the USB stick and it doesnt boot on the notebook. Is there an easier way to install from USB? read my installation guide – the other installation guide , since you have a usb stick and a real mac. It would be easier ! After installing myhack in my Asus G2S, I continue seeing 1 GB Memory(Report) RAM. But I have 4 installed GB, what can I do? Does someone help me? I have also the problem of getting the “timeout 0” error. I have a patched Bios in regards of dsdt tables. Hello. Thanks Pradeesh for the release. At first, I was unsuccessful using the main release, with mem. alloc. error. But after using the i7 version 1.04, it boots into the Vader screen, and starts to load the disc with words scrolling by in the background. However, sometime later still showing the Vader screen, the monitor went black and displayed “No Signal”, and the system reboots. Tried a few times, but it’s the same. What’s going on there, and any way out? Please kindly help. After you have the SL disc in, press tab twice and type -pci0 and all should work. checksum error while booting on 1.08i5 iso. Burned slowest level and verified data. and as I can understand installation was runned fine because computer do something with DVD drive when I press Enter key few times. I think it don’t understand my ATi HD3870 card or something like this. -pci0, -pci1 can’t help with my GTX 295 card, steel I get no signal. For those who are having problems with ATI and NVIDIA card , try a special version which I’ve uploaded. It should fix problems with your graphics card. Do give it a shot ! I can’t download Empire 1.08, always stuck in the middle. Have tried with all downloader still no luck, even try with Windows Explorer under Windows also no luck. What is the problem? Thanks a lot for help. Thanks a lot! I will try again my EX58-UD3R + Core i7 940 + 6GB memory + Gigabyte ATI 4870. Same problem as above, the download of 1.08 stops before it finishes. Can you upload to another source / site, rapidshare or something so we can test and enjoy this product? Looking forward to joining the dark side! I tried 1.08 on Gigabyte EP45-DS3R (9500GT, E7400) (my first attempt of Empire EFI!) and at 3/4 of installation PC restarted. I used Empire to boot Snow from HDD and it worked although I would be more happy if installation finished normally… Anyone else got the same thing, any ideas how to resolve this? thanks …I will try other installation methods (usb “traditional” inst. method). I have tried Empire 1.08 with EX58-UD3R + ATI Radeon 4870, all is working, only ATI 4870 and sound driver ALC888 still not work. Have tried with a lot of search, patch, edit, etc, all no luck. Anyone can help! Thanks a lot. With special 1.08 for GTX cards I get the same no signal issue. Tested with DVI and VGA connection. Hi. Great work, works like a charm on my PC. But is there any chance to get it working with a eee pc? Prob is that it doesnt recognize the mac os x 10.6 (retail) dvd when you boot from empire efi cd. None of your versions are working, I’ve tried them all! What can i do? Is there a resolution? I tried the 1.08 and it still gives me corrupt graphics at install. I have Gigabyte HD4850. If I just choose the SL retail dvd for install it stops at some point. If I want to get further I have to type -v -f but then I get corrupt graphics, all the time. Now I know I’m supposed to use vga2dvi adapter but my graphics card has two dvi’s, no vga. If I use the adapter, which would actually make it a dvi2vga2dvi adapter, would it work then or am I pretty much out of luck because my card has only dvi inputs? I tried all the legacy versions with different Bios setting, but I always end up getting the message “still waiting for root device”. I am using the Gigabyte GA-EX58-UD5, the SSD is plugged in the SATA controller and the optical drive is plugged into IDE (is that a conflict?) I’m running out of options, any suggestions on how I should let it work? Wonderful, Just Now I installed S.L. to my PC with Empire EFI Support, After than I installed Sound Card, & Display Card etc, Every Thing is working fine. (Click here to download Empire EFI V1.08 (which includes Normal , Legacy and Experimental Intel P55/Core i5/i7 8xx support), this file cannot download, please the link? but I think it’s not important. Important thing that installer runs but not switched to. Also I have question – why anyone speaks only about problems on ATi HD48xx?? My card NOT HD48XX but HD3870 and I have problems with installer did not show. I tried the versions 1.08, but I still got the message “still waiting for root device”. My motherboard is ASUS P5W DH DELUXE, and my hard drive plug in SATA-1. Any suggestions can I make it work? I also have P5W DH Deluxe board, where you get this message, because my config stops after a minute after CD swap via GTX bug. So I think, I don’t have “still waiting…”, my SATA HDD on AHCI mode turned on in BIOS, my DVD drive is IDE and connected to native IDE channel from Intel ICH7R chipset. Try the same. BIOS latest 3001. Does anyone else have problems with the blog with Firefox? On mine is screws up all the text..
No, I use Firefox, latest release 3.5.5. Empire EFI 1.08 regular version didn’t work either on my XFX X58i Motherboard, still getting “waiting for root device” error. Thenks for the efforts, I’ll keep trying whatever version that comes next! i get AppleAHCI Kernel Panic. Not the usual “waiting for root” some got. I see you injected AHCIPort for my device (2923). So AHCI works but why KPs ? Does i nead also an modified IOAHCIFamily in the preboot.dmg ? max wrote: None of your versions are working, I’ve tried them all! I’ve the same problem with 1.08!! what does it means?? @Andrea , its related to your ATI card , your ATI Card is not 100% card which follows ATI prototype/specifications/design reference , you gotta use it with another card first or do USB installation method. This card is really picky and you’ll have to use netkas’ patched package to use it. I mean its really picky ! Done. I’ve updated the links again. I’ll be looking into other issues and hopefully I’ll get V1.09 to work nicely with Intel Core i5 processors , thanks to the patches over at Chameleon forum ! After a full day trying lots of different things we eventually realised that a FULL snow leopard install disk is required. We tried using my mates 17″ macbook pro snow leopard disk but this obviously doesn’t have the AHCI drivers on – we were getting a “Mac OSX cannot be installed on this machine” error upon entering the SL install. Anyway – 1 FULL retail disc later and everything went spot on! Thanks! @ Andrea , sure I can take a look on how your BIOS accesses graphics card and at least it would help me to undesrstand more about your PC. 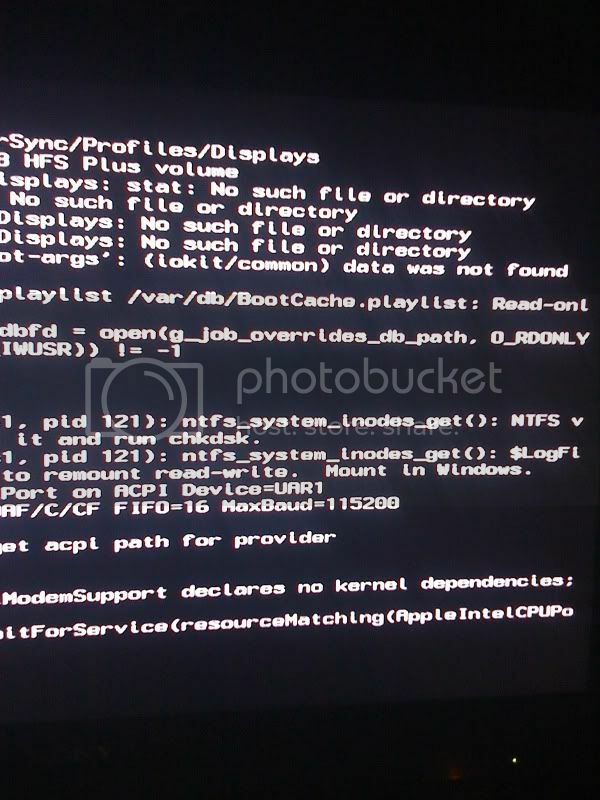 What can be the AppleAHCI Kernel Panic with my ICH9 ? You put my DEVID of SATAin the ACHIPort you used in preboot.dmg. PS: The new? EFI_EMPIRE video cant seen (forbidden) in germany. i too have the roothd (waiting for root device) error on my Computer. tried the legacy 1.08 and 1.01 “cooked” version. i don’t have AHCI enabled because my windows xp can’t handle it and i can’t reinstall with the drivers (no floppy drive…) and i managed once to install OSX86 without it. You can use AHCI in WinXP without reinstall and floppy: simply boot WinXP, install Intel Rapid Storage Technology from http://www.station-drivers.com/page/intel%20raid.htm, then restart system, set AHCI mode in BIOS and boot WinXP again, then it will work and use AHCI. i tried this and it didn’t work (bsod on startup after turning on AHCI) and also tried the matrix thing and it didn’t work. is this the reason why i get the root device error? ok i got it to load but it says i can’t install on any partition and i have to go to disc utilities and do GUID something but theres no such thing! i already formatted a partition as OSX Extended (journaled) but it keeps saying that i need to repartition them using the GUID thingy. do i need to format ALL my partitions (including the windows partition) to get it working? BTW it somehow messed up my windows so i can’t boot without a EmpireEFI cd.. Thanks i will check that SATA Port 0 for DVD. DSDT should not be an problem, because it isnt loaded (not on .iso , nor on Apple SL DVD). No real problem that AHCI-KP because i have installed already 10.5. / 10.6 :), i will stay tuned and follow the future of EFIEmpire. Question: Makes it sense to boot an Apple 10.5 DVD or is EFI EMPIRE only for SL DVD? Could you also make “Empire MBR”? I guess that 90% of newbies (like me) would like to install OsX to laptop that has MBR disk with 3 partitions: 1) windows recovery, 2) windows, 3) data partition that can be used for OsX. If you ever need emergency recover for windows, you can’t wipe the whole disk and make it GPT. Somehow these bootloaders can’t handle this. Can you recommend the most compatable mobo for a hackintosh I would like to build one now. I would like the board to be x58 or P45. Im thinking GA-EX58-UD5 for the x58 and GA-EP45-UD3P for P45. Any advice would be great! MBR ist not an thing of the bootloader / EFI. Install on MBR is disabled by Apple in the osistall.mpkg. But you can dit that – surr not possible on rog. Apple DVD, you must burn your own with that changed osisntall.mpgk. Is there a way to boot your disk image from USB? Cause each time you release new version, i have to burn a new cd. will turning my disc to GUID scheme ruin my Windows installation? The easiest way would be to buy a 2nd 2,5″ HDD. Put in the new one, and install SL with GUID. If you some day need Windows, just swap the drives. Besides, the added bonus will be more space (up to 1TB, yes WD has 1TB 2,5″ SATA) and faster HDD, since newer disks are getting faster and faster. i saw the myhack installer installs a bootloader. can’t i install osx and then install on a different partition windows and use the bootloader to boot? or to use EmpireEFI disc to boot them (like i do now with windows since i somehow made it not bootable)? hi, I have a core i5 CPU, a nVidia gtx 260 video card and a Gigabyte p55-ud6 motherboard. I’ve tried your version which is suposed to be compatible with core i5 and nvidia 2xx, but I can only get to a black screen after verbose. What should I do? Hi, just wanted to ask before i try this, is there a way to use empire efi boot cd and install snow leopard from a usb drive? jantunes , again I’ve said. If you have issues with this i5 version , try another. if fails , replace your video card and just use an old 7300gt or something ! efi v0.4 works on my Asus P5k without getting the ‘still waiting for root device’ massage. But now i’m getting a new problem. After loading i get a screen with only black and with stripes. My videocard is HD4850. How can I Update my Snowleopard 10.6 ? always the same problem for me. Installation of Mac OS SL is ok on my usb drive. When I boot again with Empire EFI, I see a Mac OS icon. I select it and when I press enter, I see a lot of lines with timeout and that’s all.Frustrating! Released Version 1.05 . It just includes fixes for ATI 48xx users and other ATI users. Hopefully you would able to get to installer and install OSX up. It disables ATI drivers altogether which forces OSX to use 1024×768 for installation purpose. Its possible to fix after post-installation. Could it be that the change log contains some, er, bogus dates? Before version 1.05, the date is given in the US format (MM-DD-YYYY), then apparently it is swapped to DD-MM-YYYY format, but without swapping the numbers. This is a 2 yr old configuration and worked flawlessly.Even detected my MS Habu mouse.. I am having trouble burning the iso images from the zip file. I am using Nero under windows. I have repeatedly downloaded and tested the zip files and the extracted iso files, but nero always hangs when trying to burn the images. Any idea? Thx worked like a charm. why isnt empire efi discussed/linked anywhere ? do people not approve of it ? can i run windows 7 on GUID partition table ? 1. Boot from Empire EFI and boot into SL Retail. 6. Can not see chameleon boot loader to choose OS. I must use Empire EFI to boot into W7 or SL. 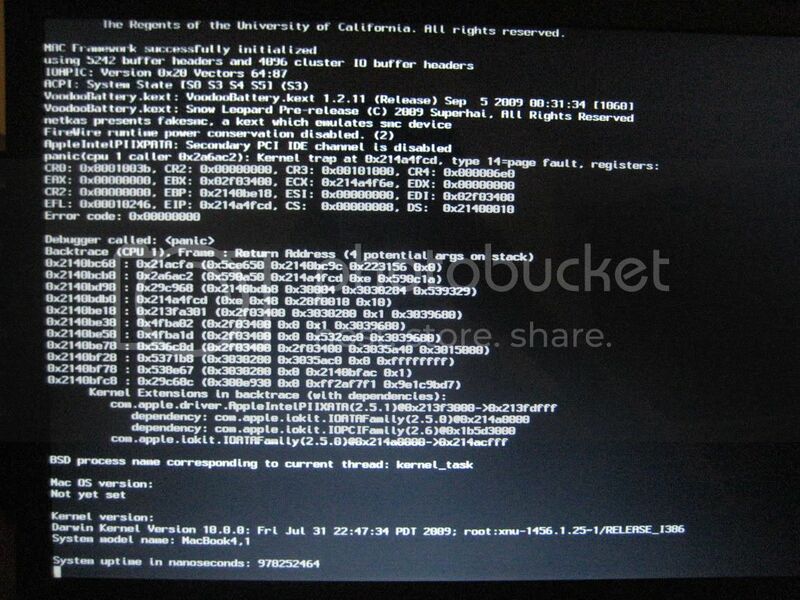 Hi, when I load Leopard DVD and press Enter, appear a prompt “boot: q”. If I press Enter… always the “boot:q”. for my second machine, i´m still waiting for a working gtx260+ installation, therefore an empire-efi version, that loads into the installer. maybe 1.09 will do it, thumbs up for pradeesh! Has anyone tried installation with Gigabyte 9800GT 1GB Silent graphig card? I am building hackintosh HTPC and that would be perfect card for it….but does it work with empire-efi? I would really like to hear if anyone has experience with this card? i just wanted to thank you- i know it’s only a small part of what empire can do, but today it saved my system that wouldn’t boot! i remembered your project, ( clever, memorable name 🙂 downloaded and burned the iso on my laptop and it booted my tower straight to the desktop! I always get a grey screen. I understand that is a know problem and that it can be fixed using GMA900 pakage. it doesn’t have the vga port so I can’t use the two wire trick. Connecting an external monitor won’t resolve the issue. Installed and am now using OS X 10.6.2. Went flawlessly. Zero hassle. Thank you Pradeesh. Thanks for this, looks great. I’ve been afraid to reinstall my P5W DH that’s running 10.5.8 but with this it looks easy. Yes 9800GT would work fine , to the dude who asked me ! Got snow 10.6.1 working (1.08 bootcd) now only need drivers for onboard sound and networkcard. P5K-VM, 3Ghz duocore, Nvidia 8600GT (can play warhammer ;-), bluetooth, Wireless wl138G v2, apple keyboard and mouse. HI, i installed sl in a x58-ud3r with a EN8400GS and graphics works perfect (two monitor, res, etc) but when i ran myhack my screen went to 1024×768 one monitor only. whats the difference of this and boot 132? Hey Pradeesh, I’m still having some issues, where I could only boot into 10.6.2 with your disc (latest ver) I think it has to do with the com.apple.boot.plist. When I use the one thats in the preboot.dmg it boots fine without the disc. But the only problem is I’m limited to 1 cpu, and 1024mb of RAM. You have any tips for me? Hi I’m planning on getting a Sony vaio and would like to use empire efi on it. Will it work? Here’s the specs. And thanks. Hope I’m not being a bother posting all the specs. But I want to make sure this computer works with Empire EFI. Again, Thank u. Please pradeesh, add support for ATi HD 3870 Kext *IF* possible within a new Empire EFI. Release. I don’t want 2 trash my ATi Card, it really works flawless with Windoze & Linux. Thanks for your help & work. I’ve tried every single image linked to from this page, and not a single one will boot for me. I get the same result with all images – after BIOS stage, blank screen… nothing happens at all, everything is just dead. One thought – I have two DVD drives – one ROM and one dual layer RW – and neither came with the system. I’m able to boot with Windows discs on the ROM drive so I assume the EFI images should work as well… though I’ve tried them all in both drives every time just in case. BIOS settings are all correct though I’ve also tried every possible combination in case I missed something. I would LOVE to get SL working on this machine… any idea why none of the images will boot? OMG I should never attempt something like this at 2am as I’m falling face down into the keyboard. My problems were entirely user error… I’m installing SL off my retail DVD right now and all appears to be working great. Well, I’m not quite out of the woods yet after all. SL installed just fine, but my machine won’t boot from the drive. I just get a black screen with a blinking cursor. I see mention of some “post installation” steps and I see files in the post install folder on my boot disc, but I would need to boot to OSX in order to run any of them… if it won’t boot, how can I do any of the post install stuff? does Empire Efi support Intel Pentium processors? @Jonathan – I’ve helped you out in projectosx. Check out my suggestion or how to approach it ! so whats the difference between boot 321 and empire efi? could it be if i installed it on a internal it would work? @pradeesh. How can I tell if the processor is the Exxx series? All it tells me is Intel® Pentium® processor T4300 800MHz frontside bus, 1MB L2 cache and 2.1GHz processor speed. is possible on a notebook vaio vgn-n11? I have to thank you once again..you saved me 50$ again.. This time i installed it on my HP lappy…Worked flawlessly again..
nvidia 9600 GT 512 MB. BTW, if I change the com.Apple.boot.plist file in the Empire EFI iso by adding the needed EFI string for my GTX 260, will it work? Pradeesh? I can use Empire EFI to boot my Snow Leopard DVD just fine. I had native resolution and everything. I couldn’t install it to a partition on my HDD because it’s MBR, not GUID. So my way around that was to restore the install DVD to a 10GB partition on the HDD. Did that, then I installed MacDrive 8 on Windows 7 so that I can copy over the modified OSInstall files. All of that went fine, but now I can’t boot the install partition. Not sure what to do. I would install it to a external HDD but then there would be no way to boot it, as Empire EFI doesn’t boot USB drives. I actually did the same thing (copying the DVD contents to an external drive via Disk Utility + Restore), and I was able to get into the installer, but I would get a kernel panic in the middle of the installer (after it checks consistency via the log). NEW IDEA!! I’ll install it to my external HDD, then ‘restore’ everything to my 30GB partition on my internal HDD. Since the SL DVD boots just fine using Empire EFI, I can install it to the external HDD via GUID. Then I’ll just use the restore function in Disk Utility to copy it all over from the USB drive to the partition. Hopefully this will work! I have a dmg of snow leopard 10.6 and I also have access to a Mac. I don’t have a dual layer DVD, so I wanted to know if I could just restore the install dvd to a flash drive, then use that with empire EFI somehow. 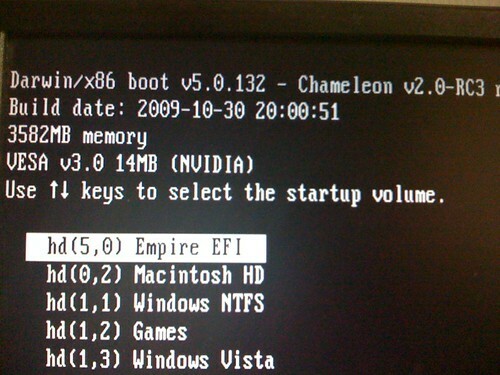 @abbed – i don’t think your bios likes the way how chameleon (empire efi) handles the boot. @Pradeesh. So would an Intel Celeron processor 900 with a Intel® Graphics Media Accelerator 4500M work better? every time i put the empire efi cd in it loads up untill it tells me to put the snow leoprd in. after i put it in about 20 sec. later it tells me to restart my pc. please any suggestion or any help would be great getting soooo maddd lol. I had the same issue. You need to disable the IDE controller in bios. Then Mac installer will not ask you to reboot. unfortunately , Mac installer doesn’t like IDE controllers. You have to use a SATA. This worked for me, I have one IDE HDD and two SATAs. When i enable IDE HDD , the mac wont boot. Check and play around in the bios settings. Mm new 1.08 for GT200 maybe broken, when I swap CDs from Empire EFI boot CD to SL DVD, nothing happened. Checked both normal and legacy editions. thanks man for the info but i have no idea how to dissable the ide controller in the bios if u could jst tell me how that would be great plz…..
1. Boot the computer into the BIOS settings. I got this from Psystar..site..might help..